12mm stretched diamonds or angular hexagons (see the picture). 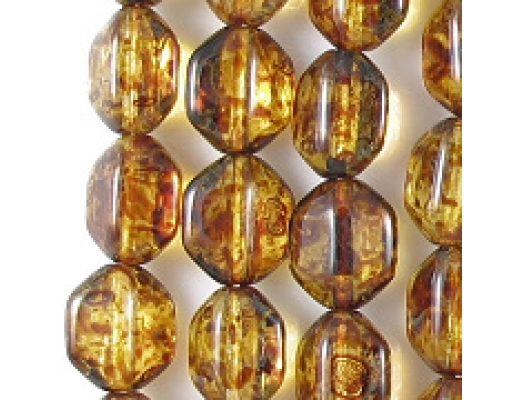 Topaz beads with a yellowish-brown picasso (mottled) coating. I haven't noticed any defects. Please note that picasso coatings are not fired onto the bead, so I don't know how durable they are. However, I've never seen any instances of a picasso coating coming off the bead. The picture is an old picture and isn't quite accurate -- in the sense that the beads aren't quite that bright -- but they are still nice beads. 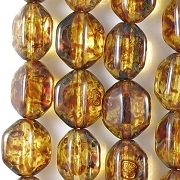 When I first got the beads, I thought they were made of clear glass with a yellow-brown picasso coating. 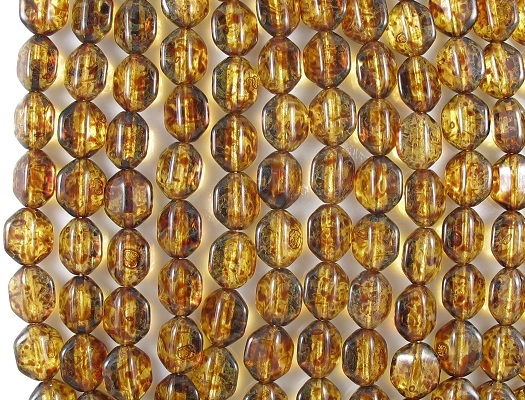 Now I think they are made of light-topaz glass.